Looking For a Successful Wisconsin – Milwaukee Truck Accident Lawyer? 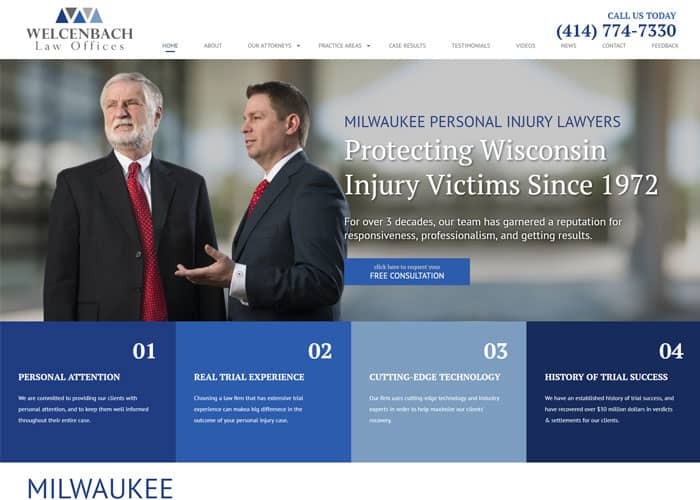 Welcenbach Law Offices is one of the leading Milwaukee Truck Accident Lawyers specializing in personal injury cases involving commercial trucking and semi-truck accidents. Truck and semi-truck accidents can cause serious harm, as well as result in lost wages, high medical expenses, and destruction of property – and you deserve compensation from the negligent party! The driving of a large vehicle takes more responsibility because it can cause so much greater harm to the public. Increased stopping distances, the greater weight of the vehicle, and long driving times are just a few of the increased risks that trucks and semi-trucks pose to the public. Both State and Federal law impose requirements on truck drivers and truck companies to keep all of us safe. The Federal Motor Carrier Safety Administration regulates interstate trucking. There are extensive rules that must be followed, including those relating to inspection and maintenance of the vehicles as well as for the hiring, training, and supervision of drivers. If you’ve been injured by a truck or semi-truck, get the compensation you deserve! Get a FREE CASE EVALUATION from an aggressive truck accident attorney. Call (414) 774-7330 now! Personal injury cases involving trucks require special knowledge of trucking laws. Welcenbach is one of the few firms with attorneys who have specialized truck accident attorneys. The trucking industry has an independent list of laws and regulations called Federal Motor Carrier Safety Regulations (FMCSRs). The attorneys at Welcenbach Law Offices know the laws and understand how to apply them to your case. Don’t trust just any lawyer to handle your accident involving a truck, semi or other large vehicles. These cases typically involve more serious injuries, are aggressively defended by the trucking industry, have more experienced defense lawyers and experts provide testimony, and must be done properly to recover. A Milwaukee car accident lawyer or truck accident attorney at Welcenbach can help you when involved in an accident. Trucking accidents can be complicated. Sometimes liability is not clear or there may be multiple parties who bear responsibility for your injuries. Insurance companies are not on your side. They are interested in closing your claim for the lowest dollar amount possible. Don’t let them bully you into settling – get experienced legal counsel. Before you settle with the insurance company, call Welcenbach Law Office. We’ll provide a FREE CONSULTATION regarding your truck accident injuries. Call (414) 774-7330 now! Contact us today to schedule a free initial consultation — we are ready to fight for you.